Here They Arethe world famous recording artists, America's favorite quartet, The Ink Spots, who will appear with Cootie Williams' orchestra this Sunday nite, November 23 at Sunset Terrace. Note the close harmony vividly portrayed in the above fotograph of Universal Attractions steller singing group that is currently a "solid" hit on a cross-country one-niter entertainment tour triumphant. 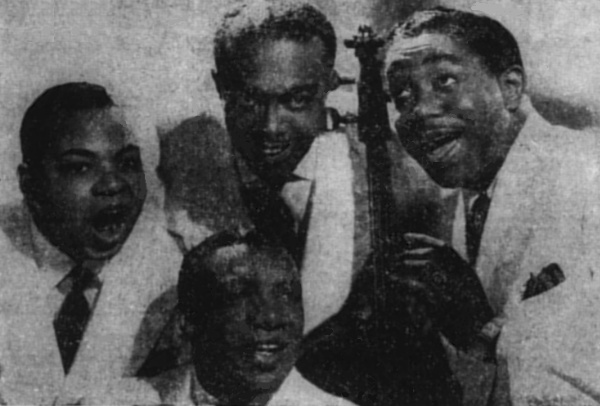 Reading l. to r., top row: Jimmy Holmes, tenor; Harold Jackson, bass; and Ivory "Deek" Watson, second baritone. Bottom row, center: Charlie Fuqua. The latter and Watson formed the Ink Spots right here in Naptown with Jerry Danielsstarting out as a trioand performed over Cincinnati's radio station WLW for two years. The act needed a bass singer and the late Orville (Hoppy) Jones was signed up. The act came to N.Y.C. (perfection personified, it was tabbed by critics); played to capacity at Harlem's Apollo and the B'way Roxy Theatre. When Daniels left the act, because of illness, an audition was held for someone to take his place. Two singers were interviewed, "Taps" Miller and Billy Kenny. Miller failed to show up and Kenny was hired. Jones died after many years with the group and now with Jackson in his bass spot and Holmes at Kenny's tenor location, the "original" Ink Spots are breaking and making records from coast to coast.